• He sees a Clone Trooper in trouble and leaps to help him before Obi-Wan tells him not to because there's no point. They have a greater mission. This doesn't sit well with Anakin, but he sees the sense in Obi-Wan's words and continues onward. • When Obi-Wan's ship is attacked by vulture droids, Obi-Wan tells him to continue the mission. "I'm not leaving without you, Master," says Anakin firmly, and proceeds to pull a variety of piloting stunts in order to help free Obi-Wan's ship of the droids and save his Master's life. 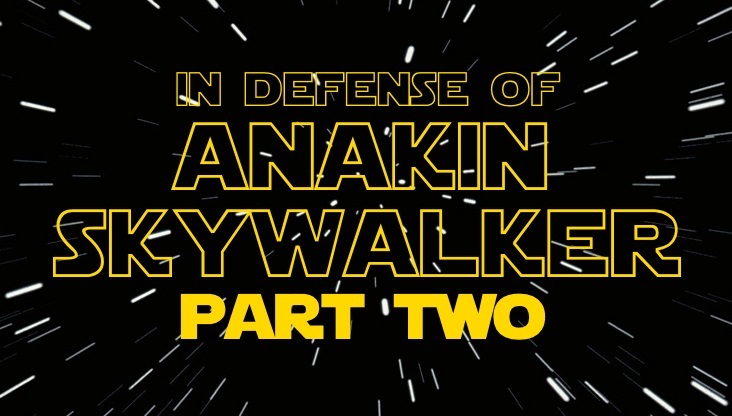 • He defends R2D2 to Obi-Wan. When Obi-Wan begins to make a funny - if demeaning - joke about the droid, Anakin interrupts with, "No loose wire jokes," and assures Obi-Wan that R2D2 is doing his best. In a plot set up by Chancellor Palpatine, Anakin and Obi-Wan rush to free the 'captured' Chancellor from the clutches of Dooku. Anakin easily defeats the older Sith and is fully prepared to show him mercy when the Chancellor encourages him to kill Dooku. He preys on Anakin's passions and rage, and Anakin finally does behead Dooku. He's horrified with what he's done, and herein we see Anakin's largest flaw - not pride, not selfishness, but vulnerability. He is open to persuasion from those he trusts. Pride is not his downfall. Vulnerability is. When Anakin and Obi-Wan return victorious to Coruscant, Anakin rushes to greet Padme. His wife gives him the news - she's pregnant, and we see several reactions at once from the father-to-be. He's shocked, and he stammers, taken aback, but his emotions finally solidify into joy. He calls the children a blessing and a gift, a reason to celebrate. He's concerned for what this might mean - Padme could lose her seat in the Senate, Anakin could be kicked out of the order - but he makes the decision to view the children as something good. It's interesting to note that throughout Revenge of the Sith, Anakin repeatedly uses the word save. He wants to save Obi-Wan. He wants to save Padme. He wants to save everyone, but he never gives thought for himself - except when it comes to losing those he loves. He grew up a slave with nothing, and now that he has something to protect, he's terrified of losing it. He wasn't able to save his mother, and that instance has obviously magnified the way he views things now. He made a promise he wasn't able to keep, and that haunts him more than anything else. Power play is a large theme in the Star Wars universe, and Revenge of the Sith is no exception as Chancellor Palpatine becomes Emperor Palpatine and offers Anakin the power of the Dark Side. Anakin accepts, as everyone knew he would, but this was not a snap decision on Anakin's part. Palpatine has watched, guided, mentored, and manipulated Anakin since he was nine years old, and it's hardly surprising that Anakin would be susceptible to his machinations. When Anakin reveals a further weakness - Padme and the unborn child(ren) - Palpatine seizes the chance to strike while the iron is hot. He uses Anakin's love for his family to complete his manipulation to the Dark Side. Anakin discovers that Palpatine is actually the Sith the Jedi have been searching for, and his first reaction is that of a Jedi - he tells the council, and the council decides to look into the matter. Anakin has no plans to stand in their way, no matter how much the situation hurts him - but he remembers Palpatine's offer, his promise that he could save Padme's life and with her, their unborn child. He remembers Palpatine's offer of life, and he runs to the citadel where he stops Mace Windu from killing Palpatine (now revealed to be Darth Sidious). Anakin catches Mace Windu off-guard, and Palpatine uses the opening to kill Windu while Anakin watches, horrified. Clearly, Anakin never meant for this to happen, and he cries, "What have I done?" as he realizes his life can no longer continue the way it was. He has aided in an unforgivable act against the Jedi. His life is over, but Padme's doesn't have to be, and so he swears fealty to Darth Sidious and becomes Darth Vader. "Anakin wanted power for himself," people say, but there is no basis for that argument. He wants love, recognition, and trust - but power? He only wanted the ability to save his loved ones. While he goes about it in a foolish way and ultimately commits heinous acts to gain what power he can, his motives were pure. Even after he has been named Darth Vader and is sent to Mustafar to kill some of the Emperor's loose ends, Anakin is full of conflict, struggling with what he has done and what he is currently doing. As he looks out across the soon-to-be battleground, a tear tracks down his face as he comes to terms with who he has become. Obi-Wan: Anakin, Chancellor Palpatine is evil! Anakin: From my point of view, the Jedi are evil. This argument actually makes complete sense, if you take the Jedi Code that Anakin was brought up to believe. There are no absolutes in the Jedi Code. Much later Obi-Wan tells Luke, "What I told you was true…from a certain point of view," as well as, "You will find many of the truths we cling to depend greatly on our point of view." The Jedi have no solid foundation of belief, and Anakin's response to Obi-Wan would make complete sense from his worldview. The Emperor finds a destroyed and dying Vader and has a medical team transform him into the Darth Vader audiences knew - 'more machine now than man' - and yet upon awakening, the 'machine's' first inquiry is, "Where is Padme? Is she all right?" The Emperor, seeing another chance to solidify his hold on Vader, lies and tells him Padme has died. Vader screams in anguish - Padme was his world, and now he has nothing to fight for except the Emperor. Some eighteen-nineteen years later, we see Vader as a mysterious villain serving a higher cause. He's regarded skeptically by most of the Empire, even those who are familiar with his presence. He's a kind of villainous Merlin, viewed by most as an outdated and superstitious magician with old-fashioned beliefs. I love how Anakin's personality is still very obvious in Vader. He has a bit more chill, he's a bit calmer, but he's still impetuous and sarcastic. He still can't resist getting into his V-Wing and helping out the Imperial fighters, even when he doesn't have to. He's still a hotshot pilot with attitude, and while it's far more subtle, it's obvious if you're paying attention. One thing I find really interesting is Vader's reaction to the Emperor when the Emperor tells Vader to seek out and destroy Luke Skywalker. His response is unexpected. He's incredulous, but there's also a hint of something else, and it's not far-fetched to assume that Vader has sensed his connection to Luke through the Force. While this kind of reluctance to harm Luke fluctuates through the movies, his initial reaction is not the one you would expect from a villain. Vader's confrontation with Luke is known even by non-Star Wars fans, but my favorite parts about it are not necessarily what's spoken, but the subtext behind the dialogue. Luke informs Vader that he knows enough about his parentage - he knows that Vader killed Anakin. Vader then utters the famous line, "No, Luke. I am your father." I've always found this scene particularly interesting - not just because it's iconic but because Vader is telling Luke the complete and utter truth. It's something that even Obi-Wan never did - in fact, nobody has ever told Luke the complete truth before. Not his uncle, not his aunt, not his mentor. Nobody except Vader, and it's in keeping with Anakin's hatred of secrets and lies. In fact, Vader never once lies to his son. I've heard many people compare Luke to Anakin and Leia to Padme, but I think far more similarities are found when you compare Luke to Padme and Leia to Anakin. Padme's last words to Obi-Wan were, "There is still good in him." Luke tells Vader, "There is still good in you." Vader does not get angry or take offense at this suggestion. He only says, "It is too late for me." It's interesting to note that Vader is never described as prideful. He never brags about his own power but rather the power of the dark side. He never claims to be invincible. As villains go, he actually presents himself in a fairly understated way. Darth Vader takes his son to see the Emperor, who intends to persuade Luke to join the Sith. And here we have the famous redemption scene - the scene where Vader becomes Anakin again for the last time. The Emperor sets Luke and Vader against each other, hoping to judge Luke's strength, and Vader preys on Luke's emotions. He preys on his concern for his sister, and here we have a line that wounds me to my core - Vader monologues against Luke, against his concern for, "….Sister. You have a twin sister." And for the first time, Darth Vader realizes he has a daughter. He, the man who never had a father, is a father not once, but twice. It's after this realization that he starts to waver, and he ends up losing the battle with Luke. Vader's death scene is one of the most important scenes both in movie history and in my personal history as a film-viewer and storyteller. Even before we had the prequels to give us backstory, it was emotional. With full backstory and knowledge of everything Anakin Skywalker went through before he reached this scene - I'm getting goose bumps just writing it. Luke Skywalker has lost. The Emperor, convinced that Luke will never turn to the dark side, has decided to kill him. Using his dark force powers, the Emperor stands over Luke and begins to kill him. He doesn't run him through with a lightsaber; he chooses to torture the boy to death while his father looks on. The Emperor is completely confident in Vader's loyalty - family ties don't matter. Not even this can sway Vader. Except…Anakin Skywalker still resides within the creature that is Darth Vader. He was always there, beneath the surface, and watching his son die in agony before his eyes is the turning point. Darth Vader, one of the most powerful Sith lords in history, does not have the ability to watch his son die. He has watched people die in front of him before. He held his mother in his arms as she died from wounds inflicted by torture. He suffered sleepless nights full of nightmares where his wife died. He has lived all this time believing that he murdered his wife - that all his efforts, that every single reason he turned to the dark side were for nothing. For the first time in the entire prequel trilogy, Darth Vader's breathing speeds up. You can hear his respirator working harder than it has before as he experiences emotions he's been suppressing for almost twenty years. You can physically hear his struggle. Listen. You need to understand why this scene is so important. Anakin Skywalker was raised a slave with no freedom. A slave with no chance of escape until the Jedi appeared and offered him a way out…but even as a Jedi, he still called someone 'Master.' He had to abide by rules, many of which were foolish or outdated. He broke those rules with misguided intentions and became even more of a slave. Never in his life has Anakin Skywalker been free. Never in his life has he not called someone 'Master.' Never in his life has he had the freedom to make a decision completely free of anyone's judgment. Which means that the only decision Anakin Skywalker ever made freely in his entire life was to die for his son. He is victorious in killing the Emperor, but it's a victory with a price. A price he knew he would have to pay, and a sacrifice he knew he was willing to make. He proves his family - his wife, his son, his daughter - right. He proves there was still good in him. As Luke attempts to drag his father to safety, Vader tells him to stop trying. They both know it's too late. Vader makes a final request - to have both of his helmets removed. The lower half of the helmet simultaneously works as Vader's painkiller, but he doesn't care anymore. It's disconnected, and the pain means nothing as he's able to look at his son's face with his own eyes. And here he says possibly the most important words in his life - "You were right about me. Tell your sister…you were right." Not 'I love you.' It isn't enough, and he already committed the ultimate sacrifice. Luke knows his father loves him. Instead, Vader chooses to tell Luke he was right. He chooses to give Luke hope, to encourage his faith in goodness. Essentially, in his last moment, Darth Vader chooses the light side. And not only that, but he sends a message to his daughter - it's too late to fix things with her, but he remembers her. He is thinking only of his children. Because in that moment, he was not Anakin Skywalker. He was not Darth Vader. He was Luke Skywalker's father. And he was a good man. WOW. After all this time, all the comments I've heard about Anakin and felt discouraged over, someone FINALLY DOES. A good argument for Anakin that gives me chills too. This is good. Good. Excellent. Wow. I agree--Luke is more like Padme, and Leia is more like Anakin. Also, I can't wait for Kylo Ren to figure this all out. Oh my gosh. Oh my gosh. Oh. My. Gosh. This was so so so good, I was nearly in tears by the end of it!!! I always thought Shaking was whiney and annoying, but I see how flawed my thinking was! I mean, I loved his character development and his whole mindset and EVERYTHING in the Clone Wars, and after watching it, I did see some of that same character in the movies. I just never REALLY thought about how selfless and amazing Anakin really was! I cannot help but see that complaining runs in the Skywalker family- the males at least- but I really understand them better now. Thank you so much for this fantastic article!!!! I am in awe of Anakin's character now.